OxyContin contains oxycodone, but includes a time-release mechanism so that the pain-killing effect lasts longer (meaning the drug does not have to be taken as often). But do oxycodone and OxyContin differ in other ways, also? We review here. Both oxycodone and OxyContin is used for pain relief. Basically, the main active ingredient in OxyContin is oxycodone. However, Oxycontin has been manufactured to include a time-release mechanism to increase analgesic (pain-killing) effect. Essentially, producers have changed how long OxyContin lasts, which means that OxyContin users do not have to take the medication as often. Does OxyContin work for everyone? Not always. Here, we review this and other considerations when deciding between the two. Then, we invite your questions about oxycodone vs. OxyContin use at the end. 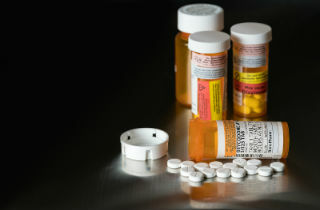 Prescription drug abuse has been on the rise, especially pain pills. In fact, pain pills are highly addictive and rather easy to get your hands on. Plenty of doctors are prescribing them for real (or imagined) pain, and plenty of drug dealers on the streets have them handy for those who are in need. Two of the most frequent prescribed pain pills are OxyContin and oxycodone. You may think that these two pain pills were the same thing, but there are differences. OxyContin was developed in 1995 for those suffering from mild to moderate pain and needed pain relief around the clock. Basically, OxyContin has oxycodone in it, but it has a time-release factor so that the pain-killing effect lasts longer (meaning the drug does not have to be taken as often). Oxycodone is an opioid narcotic painkiller that, when taken, has an immediate painkiller effect. It is oxycodone that people believe is the lesser of two evils because it is actually combined with Tylenol or ibuprofen. In fact, Percocet, Tylox, Percodan, and OxyContin all contain oxycodone. OxyContin has a much stronger effect on pain because it is has a high concentration of oxycodone in it. Medications that have oxycodone added may relieve pain for between 4 to 6 hours, but OxyContin can relieve pain for about 12 hours. The U.S. Drug Enforcement Administration (DEA) states that oxycodone has been abused for over three decades, but when OxyContin was introduced, the abuse escalated greatly. In fact, OxyContin is not only highly addictive – it is also lethal. The euphoric feeling that it gives can cause people to want to use more and more of it, which can lead to respiratory failure. If used with other drugs like alcohol, the risk increases greatly. What is OxyContin called on the street? Experts state that OxyContin is the most abused opioid in the United States because of the strong dosage. It is easier to abuse because many people sell such opioids on the streets and still others find plenty of opioids in medicine cabinets of family and friends. Prescription drug abuse via pain pills is quite high, as many people like the euphoric and relaxed feeling that painkillers give them. There are various ways that those who abuse the drug do so. Some crush the pill and either snort or swallow it. Others may dilute the pill in some water and inject it. What this does is destroy the time-release mechanism so that the person gets a strong euphoric feeling right away. In fact, some users state that they get just about the same feeling when they use heroin. If you feel like you are addicted to prescription pain pills, it is important that you reach out for help. You can talk to a therapist, attend a detox, rehab, and find some support through 12 step recovery groups. The statistics on prescription pain pills are alarming; the Center for Disease Control and Prevention stated that in 2011 more people died from using pain meds than from using illegal drugs. Reach out today for help if you feel you are addicted to pain pills as there is abundant help available. You do not have to live a life of addiction, but rather get free and live a life of freedom, peace, and joy. Take the first step toward freedom today by reaching out for help. About the author: Dominica Applegate is an author, writer, personal development and relationship expert. She has a deep passion for discovering and sharing authentic spiritual truth. She has been discovering herself under all sorts of odd layers and loves to share her stories and lessons learned with anyone that will listen. She loves reading, contemplating, nature, family time, and traveling. Read her ongoing guest blog at Pat Moore Foundation or connect with Dominica through her website. This article was written in 2014. It is NOT easy to get any pain medication from Doctors in Washington state. And because of people like me who have REAL pain and have the records and MRI to prove it, people are going to heroin more and more every day. Because its easier to find, costs a lot less and you don’t have our insurance companies controlling what your doctor can and can not give you! They, the insurance companies, have a monopoly on not only medical insurance but our medications as well. My diabetic medication which is Trulicity is 1,000 dollars for 4 syringes which is taken once a week for a month. They have got way too much power. OxyContin was a blessing for me! I took it for over a year when I had severe arthritis pain. I kept telling my ortho dr that I needed joint replacement surgery because I couldn’t function and he kept telling ,me it wasn’t bad enough yet. I had to take an oxy and wait for it to take effect before I could even get up in the morning, and had to shower and do whatever chores I could before it wore off–rest for a few hours, then take another oxy to get thru the rest of the day. When I finally switched ortho drs and got the replacement that I desperately needed (the 2nd ortho guy apologized for me having suffered unnecessarily for so long) my arthritis pain was nearly gone. I still have arthritis in other areas, but not as severe. Anyway, from having been on oxy for so long my body had built up such a tolerance for it that post-o pain management was a nightmare. In the recovery room I begged for something for pain and it took 4 or 5 doses of morphine before I finally just passed out and got relief that way—from being unconscious. Withdrawal was not a problem as I had a ‘natural’ withdrawal as I needed less and less pain meds as I healed and within a couple of weeks was totally off any pain meds other than Tylenol. OxyContin is a Godsend when you need it, but does have it’s drawbacks as I found out post-op! Will need another joint replacement sometime probably in the next year or 2 but will not let it go to the point of needing an opiate to function. Don’t want to go thru that post-op nightmare again!! BTW — I told my dr I was concerned about becoming addicted to the oxy and he explained that I was addicted after taking it for over a year, in increasingly higher doses. He told me I was confusing ‘addiction’ with ‘abuse’. He said although he knew I was not abusing the oxy, my body was definitely addicted and if I were to quit cold turkey I would go through withdrawal just the same as any abuser would. And that was an eye-opener as well as a really scary revelation for me!! I was prescribed OxycontinIR 5mg x3 every 4 hrs post open heart surgery. At my 4 wk checkup dr refilled my current script, however after getting the refill home from my pharmacy I noticed the bottle says Oxycodone and i dont think im receiving the same benefits as the former(after one dose). Was a mistake made? Should I contact my pharmacy and question what the original rx says vs what I received? Hi Jason. Yes. You may call your pharmacy to ask what has happened. Hi Shirley. Chewing oxycodone is actually a way of abusing the drug. I live in and have lived in, massive pain for the past 20 plus years. I only started going to a “pain clinic” four years ago when I found myself thinking that I didn’t want to experience another day with the pain. I wanted OUT and was devising ways to achieve that goal. Since then, with the help of prescribed meds I find most days tolerable but NOT good and NEVER great. It pisses me off to no end when the label ADDICT gets tossed around so easily. All the “well meaning” lawmakers devising harder and harder ways for people in pain to get the meds they need are way off base! Making more laws for the law breakers to ignore only makes it more difficult for people like me. Stop the utter stupidity and let the abusers KILL THEMSELVES OFF and leave those of us truly in need the hell alone. The world would probably be a better place without them anyway. I was always told that Oxycodone and Oxycontin were the same, except that Oxycodone was immediate relief for pain and Oxycontin was time released. Today I was given Oxycodone ER and I questioned it.. I was told that Oxcodone is Generic for Oxycontin, which didn’t make any sense to me. This is fine as long as it is time released and I am getting what I need for pain, but why all of a sudden has the story changed? Why wasn’t I prescribed Oxycodone ER all along instead of Oxycontin? It’s a BIG difference in price. Oh, by the way, my prescription was written for Oxycontin and they supposedly gave me the generic. What’s going on???? Yeah their is a HUGE DIFFERENCE between the two drugs. OxycodoneIR has been changed by the FDA since it was re -released. It was pulled from the shelves when the new OP Oxycontin was released, then after strict FDA re-formulation standards, the generic makers of the IR version were allowed to put their OxycodoneIR back on pharmacy shelves. Oxycontin is a very, very, concentrated form of Oxycodone. I personally think Pherdue got it right with their formula, because the OxycontinER works 10x better than the generic OxycodoneIR’s 10/20/30 mg doses. I am 63 and suffering from chronic, unbearable pain from arthritis. My doctor has prescribed Percocet for the past 4 yrs. Recently she changed to Oxycodone (2 times daily) I keep 25mg of time released morphine in my system (2 daily) . I only take the oxycodone when I have things to do like laundry , shopping etc. but I’m scared because of all the press. I am very careful NOT to take any more than prescribed but I cannot move without these medications. I take the oxycodone about once a day when the pain becomes overwhelming. Am I in danger? How Long do they stay in your system for? I just took one before its the first time I’ve these and was wondering if they show up in a urine test? And if so how long till I’m clear? Hi, Charlie. OxyContin and oxycodone can be detected in the urine up to 1-4 days after the intake. There is no difference in withdrawal. Oxycodone overdose: How much amount of oxycodone to OD? How much oxycodone is too much?